Filing taxes can be a hassle and that’s why it’s important to keep a record as you go about receiving payments. In this post, we’ll discuss how taxes work in EZRentOut. Taxes can be configured from Your name at top right -> Settings -> Company Settings -> Tax Details. Here you can edit, delete or add taxes. A tax is identified by it’s Name and Rate. When creating taxes, you can choose a name for the new tax rate, give a tax rate in percentage and configure if it applies to every order or not. Please note that we support multiple taxes on each order. From the Tax Details, you can configure which entries in an order are included in tax calculations and which ones are not. These entries include – Order Discounts, Promotional Discounts with Bundles, Custom Entries, Coupons, and Damages. For example, you may want Discounts to be included in tax calculations but not the Damages. 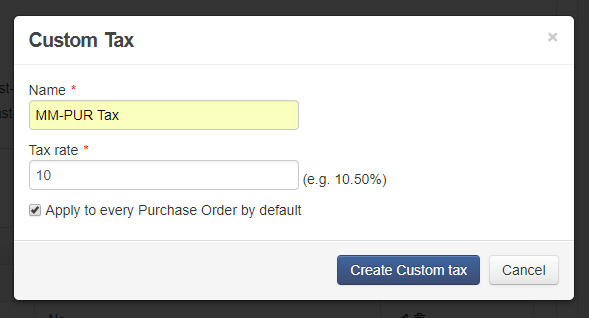 Multiple custom tax rates can also be applied by default to every purchase order. Go to Settings → Company Settings → Tax Details for Purchase Orders → Edit/Create New Tax → Click ‘Apply to every Purchase Order by default’. For this to play out, Purchase Orders must be enabled under Settings → Add Ons. You can also change a PO tax rate from the Order Line Items section. Customizability is so important to us! This is why you can include custom entries in tax calculations from within the PO details page. You can select it under the Tax details in Company Settings. Learn more about Purchase Orders in EZRentOut. If you’re using the QuickBooks or Xero with EZRentOut, you may need to do a few extra steps. These details are available on our integration guides for QuickBooks and Xero. Only one tax is applied per order. You can change the tax rate on order level from Order Detail -> Action button on the left saying ‘Change Tax Rate (as long as the order is in Draft or Booked state). On the order details, the Yellow and Green tags tell that the order line item is taxed. Yellow signifies that it’s not. You can click on the colored tags to include or exclude the line item in tax calculation. All prices are tax exclusive i.e. the price doesn’t include the tax. If you don’t collect taxes on a few items, you can make them tax free by checking the ‘Tax Free’ option when editing/creating these items. Similarly, you can make some of your customers tax exempt. You can pull up the tax report from MORE -> Reports -> Financials -> Tax Collected. Depending on the duration for which you want to get the tax records for, set up the filters and generate the report. You can also export this report to excel for further calculations. Your suggestions and feedback is important to us. Let us know what enhancements would you want to see at support@ezrentout.com. The User Community Forum is a great place to log suggestions and discuss them. We’re also active on Twitter @EZRentOut. Follow us to stay in touch with what we’re up to. Updated: This post was updated on April 25, 2018, to reflect changes in adding tax rates for purchase orders, if a PO module is enabled. This entry was posted in [Support], Feature, productivity and tagged tax, tax management by admin. Bookmark the permalink.